Kayak-iti-Yat offers both residents and visitors a unique way of exploring New Orleans...via a kayak. Kayak-iti-Yat is a family-owned and operated business that specializes in kayak tours. Tour participants get the opportunity to leisurely glide their way along historic Bayou St. John. 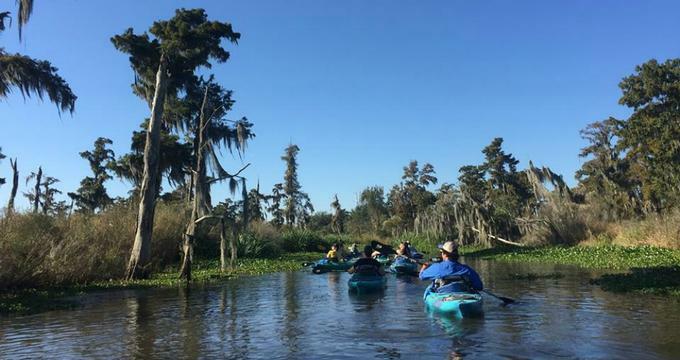 During the kayak tour, the friendly tour guide will provide a thorough history of the importance of the bayou while also offering tour participants the opportunity to see what life is lived along its banks. Not only are there people to watch but there is also nature at its fullest to be experienced, right in the middle of New Orleans. · Big Easy Bayou Tour - This is a 2-hour kayaking tour that is perfect for first-time kayakers. Tour participants will take in the beautiful architecture of the West Indies-style homes while learning about the history of Bayou St. John. During warmer weather, a romantic twilight version of this kayak tour is offered. · Pontchartrain Paddle - This is a 4-hour kayaking tour that requires a bit more stamina then the Big Easy Tour. On this particular tour, individuals will be paddling the entire length of Bayou St. John in both directions. Tour participants will get the opportunity to learn more about the various neighborhoods alongside the bayou as well as find out more about New Orleans’ unique and somewhat complicated ecosystem. · Cruisers and Kayaks - This is a collaborative cycling and kayaking tour brought to you by the Confederacy of Cruisers and Kayak-iti-Yat. This 4-hour tour starts off with 2 hours of cycling from the Confederacy of Cruisers headquarters at Faubourg Marigny to the Faubourg St. John, where Kayak-iti-Yat takes over with 2 hours of kayaking. This is a comprehensive tour experience that exposes participants to six or seven New Orleans neighborhoods. For more information about the various kayaking tours available through Kayak-iti-Yat, visit their website. Kayak-iti-Yat offers kayaking tours 7 days a week all year round. At times when the weather is inclement, tours will be cancelled accordingly with proper notice. Bookings must be made with at least a minimum of two people. Please visit their website for more information on how to reach the kayak launching site via public transportation or by driving and biking. Kayak-iti-Yat advises tour participants to dress weather appropriate for kayaking tours. Give someone the experience of an exciting kayaking adventure through New Orleans with a Kayak-iti-Yat gift certificate. Gift certificates are available in several denominations or by choosing a specified amount. They can be used for any kayaking tour, and they never expire. Gift certificates are delivered via email. Those desiring a physical copy of their gift certificates can contact Kayak-iti-Yat via email.